The young H.G.Wells seems, with hindsight, to have exploded onto the literary world with a procession of breathtakingly original conceptions – The Time Machine, The Island of Dr. Moreau, The War of the Worlds – whose diversity and fertility he would struggle to match over the long career ahead of him. But what is rarely appreciated today is that these early works are not a diverse series of imaginative confections, but a sustained polemic on a single theme. 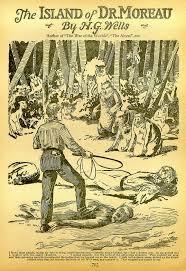 That theme is the social ramifications of evolutionary biology, which remained Wells’ core concern until the painful overthrow of his theories in 1896, a process documented between the lines of The Island of Dr.Moreau. In trying to use contemporary Darwinian narratives of evolution and degeneration to model the future of humanity, Wells set himself up for bitter failure, but in the process he succeeded resoundingly in fashioning a series of enduring myths of the modern age. Just as the classical myths of metamorphosis, set in the distant past, explored the boundaries between humanity and nature, and our relationship with the animals and the gods, so Wells’ stories of evolutionary metamorphoses explore the contemporary questions of what we may become in the future: how the limits of our species might be redrawn, how far our dominance over nature can extend, and whether technology will remain our slave or become our master. These were questions that had got under Wells’ skin in 1884, when he had spent a year at the Normal School of Science in South Kensington under the tutelage and spell of T.H.Huxley. Huxley, like Wells, was a man of humble origin, and his account of evolution was rich with the exhilarating sense that everything must change, and that the history of the world was like a game of snakes and ladders, where those who appeared to be winning were also the ones with furthest to fall. Ten years later, a struggling journalist who had been invalided out of the teaching profession, Wells reached back to Huxley’s account of evolution for the big idea that would make his name. It first took the form of an essay, published under the title Man of the Year Million, which opened: ‘As Ruskin has said somewhere, a propos of Darwin, it is not what man has been, but what he will be, that should interest us’. Man, Wells speculated, was even now in the process of evolving into something unrecognisable. We were losing our ape-like traits – hair, large jaws and ears – and becoming smoother, with ‘a larger brain and a slighter body’. Wells moved incrementally to a haunting image of the man of the far future: floating in a marble pool filled with nutritive liquid, encased perhaps in a vast crystal dome, by this stage no more than a huge, sensitive hand controlled by a vast brain, the rest of his body shrivelled to a ‘dangling, degraded pendant’. The future man, it seemed, would strike us today as a grotesque alien – a theme to which Wells would return. But Wells was also aware that, even if the human species were to survive into the far future unchallenged, there were other forces that might destroy it from within. He was particularly under the thrall of the eminent biologist E.Ray Lankester, whose work had highlighted a gloomy sub-plot in the Darwinian story. In his journalism Wells reproduced Lankester’s demonstrations that many species appeared to have evolved not onwards and upwards, but into retrograde and degenerate forms. The barnacle, for example, had once been a complex crustacean like a crab, but had lost its powers of locomotion and become no more than a mollusc; the ascidians, or sea-squirts, have highly-developed organs, including eyes almost as sophisticated as those of vertebrates, but have regressed to become shapeless, floating bags that could almost be mistaken for vegetables. Might civilised man, his animal part already atrophying with disuse, be headed for a similar fate? The Time Machine absorbed all the themes that had been nagging at Wells since his teenage discovery of science, and harnessed them to a narrative on a scale never previously conceived – where all life, up to and including the death of the solar system, was contained within its frame. In the Time Traveller’s first stop, above ground live the Eloi, fragile and passive creatures who have begun the journey outlined in Man of the Year Million, their animal features receding and their digestive systems no longer able to assimilate meat. 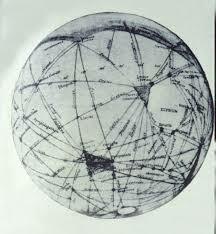 Their nemesis and predators, the Morlocks, have made the opposite transit: they are the Coming Beast that Wells had previously proposed alongside the Coming Man, a subterranean throwback to our simian ancestry but also the repository of the industrial and mechanical culture of humanity that the Eloi have lost. Here were Darwin and Lankester’s theories brought viscerally to life for the mass of the reading public who had never been exposed to them in their scientific form. But they were also harnessed to an explicit social warning, equally resonant and as familiar today, that if inequalities of class are allowed to persist and deepen, they may eventually harden into this type of grotesque subspeciation. The Eloi would have been specifically recognisable to Wells’ Victorian readers as a satire on the Bloomsbury and Yellow Book set, the art-for-art’s-sake aesthetes lazing in the sunny uplands of society while the brutalised workers toiled beneath them. And for Wells himself, the resonance of the Morlocks was a deeply personal one: his mother, a servant at the country estate of Up Park, had spent many years literally working underground. The Time Traveller’s journey was fantasy, but it was not escapism: it was a future all too recognisably birthed by the present. As the Time Traveller ventures onwards to the far future, he finds the implacable processes of degeneration and extinction advancing towards their endgame. The Eloi, in a shocking scene from the serial version cut from the finished novel, are encountered in the twilight of their journey, where they have regressed to scurrying vermin, their human origins still dimly and horribly discernible. After their extinction, giant crabs and sea-slimes claim their dominion over the dying red planet. The calculations of the physicist Lord Kelvin, which had demonstrated that the sun’s furnace must burn itself out within a few million years, meant that the deep past so recently revealed would not be granted to the future. However ingenious man’s efforts, we were ultimately doomed. The best response available to us was the stoic resignation of the Time Traveller: ‘If that is so, it remains for us to live as though it were not so’. It was a vision that cut across the prevailing Victorian faith in the forces of social progress, and challenged the complacent view that evolution meant a smooth ascent onwards and upwards towards perfection. Were we really fated to be no more than pillion passengers on a random evolutionary journey, or might we find a way to steer towards a future of our own choosing? How might we master the forces of evolutionary change that were operating on and around us, and shape them to our will? These were the questions that were to be addressed in, around and between the lines of his next major work, The Island of Dr. Moreau, Wells’ struggle with the defining question of whether and how far the future can be brought under humanity’s control. He marked out his early intentions with an essay entitled The Limits of Individual Plasticity, in which he questioned how far the humanity of the future would remain bound by our biological inheritance. Could not bodies already be restructured by the newly-developed techniques of ‘plastic’ surgery and tissue grafting, and minds be reprogrammed by techniques such as hypnosis? ‘The birth tendencies are only one set of factors’ that determine our future. Might new discoveries reveal that we are far more ‘plastic’, malleable creatures than we have thus far imagined? And how can we know until we have explored these discoveries to their limits? The character of Dr. Moreau, and his experiments to transform beasts into men, had already begun to take shape in Wells’ mind. Wells himself had a good knowledge of anatomy: he had taught it in his previous incarnation, and even written text books on how to dissect rabbits and dogfish. Like Moreau, he knew what it was to have blood on his hands; he was engaged in the current and passionate anti-vivisection debate, which turned for him on the question of how pain was perceived by animals with nervous systems less sophisticated than man’s. In another essay, he speculated that pain had arisen as a crude evolutionary adaptation, and the future might see it designed out of the human condition altogether. But there was another current debate that went to the heart of his questions, and of evolutionary theory itself: could the kind of ‘plastic’ interventions that Wells had in mind be patched into the hereditary process and transmitted to succeeding generations? To many scientists it seemed that, to some extent at least, this must be possible. Darwin himself had been less than specific about the mechanism by which biological inheritance was actually passed on, but it was well known that alcoholics and syphilitics, for example, risked transmitting their conditions to their progeny. 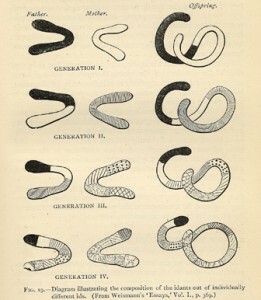 Yet a German biologist named August Weismann had recently made a dramatic intervention, claiming to have shown that acquired characteristics could not be inherited, and that the information passed from parent to offspring was contained in a ‘germ-plasm’ that passed through the generations unaltered by the life that the parent had led. Weismann’s theory would eventually be recognised as the first statement of what we now know as genetics, but there were many in 1894 who found it implausible, Wells among them. Weismann had no certain answer as to how change, variation and mutation might interruupt his closed system; for Wells, flushed with ideas about how to make natural selection redundant, this uncertainty seemed enough to dismiss his depressing theory. In a science feature in the Saturday Review he ridiculed the idea that the mature adult might be perfectly formed in microscosm in the egg, immune to all subsequent influences. But Wells’ engagement with this scientific debate would continue in tandem with the writing of Moreau, and the story’s eventual resolution would reflect a profound change of heart. But the book was to be about more than plastic surgery and biology. 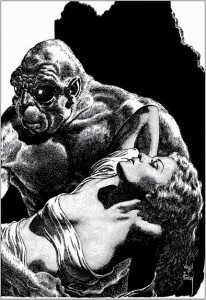 The society of surgically-altered beast people, and Moreau’s attempts to encourage their human traits and repress their bestial ones, were also Wells’ entry-point into the contested question of the implications of Darwin’s theory for human society, its laws, its ethics and its political organisation. Although Darwin had publicly proclaimed himself neutral, both his Malthusian logic and several of his private pronouncements supported the thinkers close to him, such as Herbert Spencer, who claimed his mantle in the name of laissez-faire economics, imperialism and the dominance of the civilised races. The term ‘survival of the fittest’ had been coined by Spencer, and Darwin had later admitted preferring it to his own ‘natural selection’. For ‘social Darwininsts’ like Spencer, the elimination of the poor and technologically backward might seem harsh to human sensibilities, but had to be seen in the context of the ‘decrees of a large, far-seeing Providence’ that was using the laws Darwin had revealed to progress to a better world. ‘The study of nature’, as Wells would have Dr. Moreau say, ‘makes man at last as remorseless as nature’. But there were others who claimed that Darwinism had entirely different political implications. Karl Marx had wished to dedicate Das Kapital to Darwin, on the grounds that it showed ‘the basis in natural science for the class struggle in history’. Darwin’s co-discoverer of evolution, Alfred Russel Wallace, believed that his theory demonstrated that a world-socialist state was the only form of government that would allow man’s higher nature to flourish. The anarchist prince Peter Kropotkin, lecturing in London in 1893, argued that Darwin had shown society’s natural form of organisation to be the self-organising and mutual cooperative, and that the Darwinian selection of political systems would eventually transcend the already atrophying nation-state. All agreed that Darwin’s theories had set these age-old questions of politics on a scientific footing for the first time, and that science must prevail in pointing the way forward; but they disagreed profoundly about how to read the signposts. Wells had already written about the paradoxes of competition and cooperation: how, from the early stages of life such as sponges and coral, communal structures had delivered paradoxical advantages in the struggle for existence. But, just as Weismann’s experiments were questioning the limits of plasticity, the foundations of the ‘social Darwinist’ debate were being shaken by Wells’ old mentor, T. H. Huxley. Huxley had previously been associated with a harsh and imperialist interpretation of Darwinism, stressing the ‘gladiatorial’ nature of natural selection; but in his lecture on Evolution and Ethics at Oxford in 1893 he had dismissed the entire notion that Darwin’s theories might have anything to teach us about how to organise society. The state, he insisted, should not be an extension of nature but a corrective to her tyranny. Civilised, or ethical man, was formed by the pursuit of justice, a concept entirely alien to nature. Early civilisations had developed passive philosophies, Stocism or Buddhism, to accept this truth; but modern man was now empowered to fight back against nature, and to make life humane and civilized as never before. “Just after I make them, they seem to be indisputable human beings. It’s afterwards as I observe them that the persuasion fades. First one animal trait, then another, creeps to the surface and stares at me…”. The book finally emerged with a vision even bleaker than that of The Time Machine. The future of Eloi and Morlock, dark though it had been, had at least had a logic: it had emerged by a chain of cause and effect from human actions passed down the generations. In the world of The Time Machine, humanity might have changed its ways and escaped its destiny. But now, he accepted, it was a vision that had been based on scientific error. The story of Dr. Moreau showed that, however much we might wish it otherwise, ‘natural selection grips us more firmly than it ever did’. If we wish to improve humanity’s lot, we must do so in the teeth of nature rather than in harmony with her. ‘The business of science’, Wells concluded grimly, ‘is not to keep up the courage of men, but to tell the truth’. Wells was now, reluctantly, convinced that there was no escape from the cul-de-sac of nature and its tyrannical laws; yet it was clear to him that the future was none the less upon us, and needed urgently to be anticipated. His next move would be the volte-face that would set him on his mature career – and, by the same token, betray the vision of his youth. By his thirtieth birthday, in September 1896, he had produced not only the scientific essays that would underpin his new strategy for the future, but also his most successful novel yet, The War of the Worlds: a story that would encapsulate this revised future in mythic form, and would long outlive the theories that had birthed it. It was a claim that demolished the foundations of all his major work to date, but it was ammunition for the argument that would drive his thinking for decades to come. In evolutionary terms, he conceded, there was no difference to speak of between Palaeolithic man and his modern-day successors. The difference, though vast, was wholly an artificial one: an accretion of discovery and technology and civilisation that the man of ten thousand years ago, if transported to a modern metropolis, would have no chance of comprehending. Might not the Man of the Future, then, still be able to supersede the man of the present in ways that we are yet unable to imagine? The laws of nature might be immutable, but artificial evolution on this scale could make them irrelevant. To put flesh on the bones of an artificially-evolved future, Wells began to imagine alien life-forms that might have embarked on such a process in the distant past, and how they might look to us now. He wrote various essays proposing life in other galaxies, or based on silicon chemistry rather than carbon, that look forward to the artificial life simulations of the present day; he paid particularly close attention to another debate equally familiar today as to whether the desert planet Mars might have had water, and thus life, in its distant past – and indeed whether, as the Astronomer Royal Percival Lowell proposed, it might today be home to desiccated and dying life-forms. He considered the fate of the Tasmanian people, who loomed large in the conscience of the civilised world as the first race deliberately driven to extinction by colonists who countered their spears with modern rifles, and tried to imagine how an alien race of similar technological superiority might appear to us. This was, of course, an act of the imagination that he had already undertaken, and with which he had begun his journey into the future. 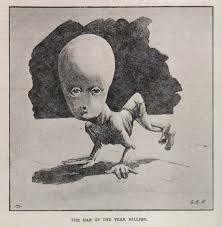 The final stage of humanity that he had envisaged in Man of the Year Million was as alien to humanity as anything from a distant galaxy: giant brains, the rest of their bodies reduced to vestigial sacs except for a super-sensitive hand to transmit the brain’s instructions to the advanced technology that had become their exo-skeleton. There was a pleasing irony in demonstrating the possible scope of artificial evolution by visualising the human race being annihilated by our future selves. Cycling around Woking and along the Thames towards London, Wells began to trace the route of an invasion by Martians who, for all their outlandish tripods and tentacles, were in reality our own great-grandchildren. 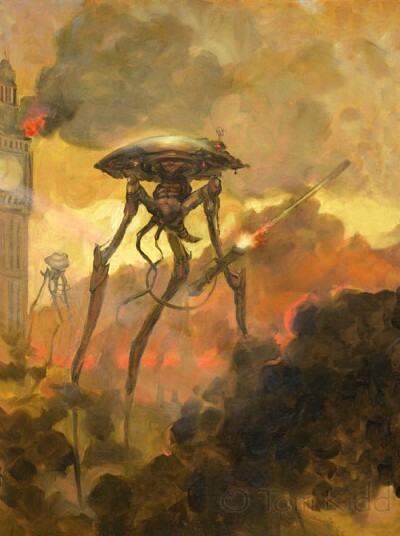 When War of the Worlds was launched on the public during the Jubilee year of 1897, its impact was sensational, and its message the strongest possible contrast to the national mood of celebration and self-congratulation. It punctured the sense that Britain stood at the summit of civilisation by conjuring all too vividly how brittle such a civilisation really was: how rapidly an unforeseen crisis might shatter it, and how little consolation our traditions or religious faith would have to offer. In visualising the wholesale destruction of modernity, Wells was not mocking the idea of progress, but of complacency. This was iconoclasm with a purpose: to spur his readers on to the remaking of the world, to which Wells would now turn his own energies. For the next fifty years he would seek to drive humanity towards social and political change, towards open societies and world government; but although he would continue to collaborate with scientists like Lankester in other capacities, he would never return to the narratives of biological evolution that had been the ruling paradigm of his greatest work. A version of this article appeared in the Times Literary Supplement (September 1997) and formed the basis of lectures for the Wellcome Trust Centre for the History of Medicine/UCL.